Team focused professionally hosted – Play Your Cards is a real ace! Higher! Lower! Higher! Lower! Freeze! 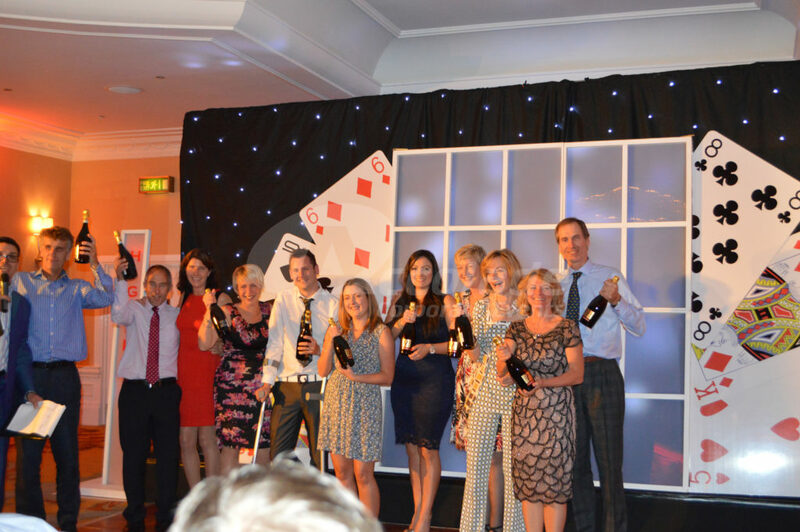 We asked 100 corporate events organisers if their team enjoyed our Play your Cards gameshow…our survey said…YES! We bring this fantastic team event to your evening, yes it’s a little bit cheesy but isn’t that part of the fun? 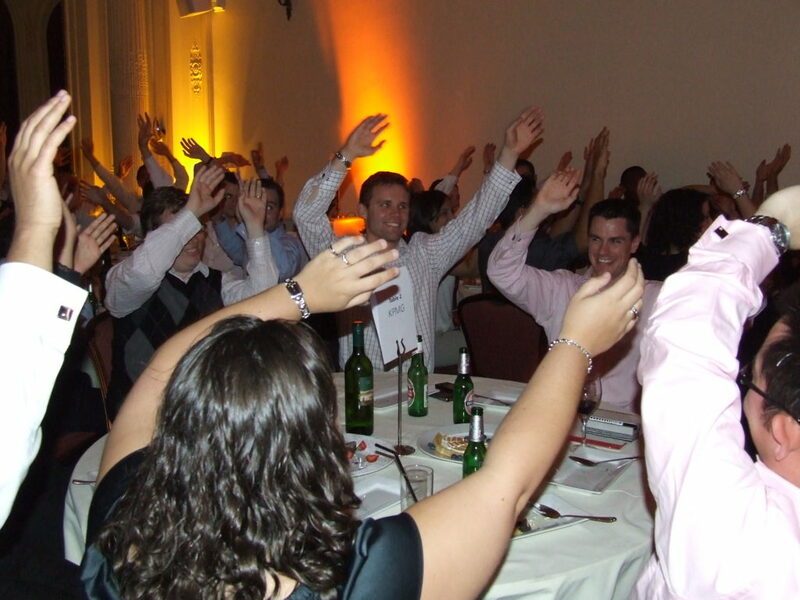 Our professional host is an expert at the quick retorts for any of your teams that think they can mess with the deck, this is definitely a night of fun but as always with Accolade Corporate Events, it’ll be slick, professional and a quality performance! We’ve been hosting our Play Your Cards Gameshows for over 20 years now, we’re experts at making sure the show runs smoothly and everyone has a great time. Our illuminated giant card wall and giant playing cards take centre stage and create a great impact for your guests. Game show music, lights and a huge helping of audience interaction make Play your Cards gameshow a great event. We bring this fantastic gameshow to you, to the venue of your choice, anywhere in the UK. 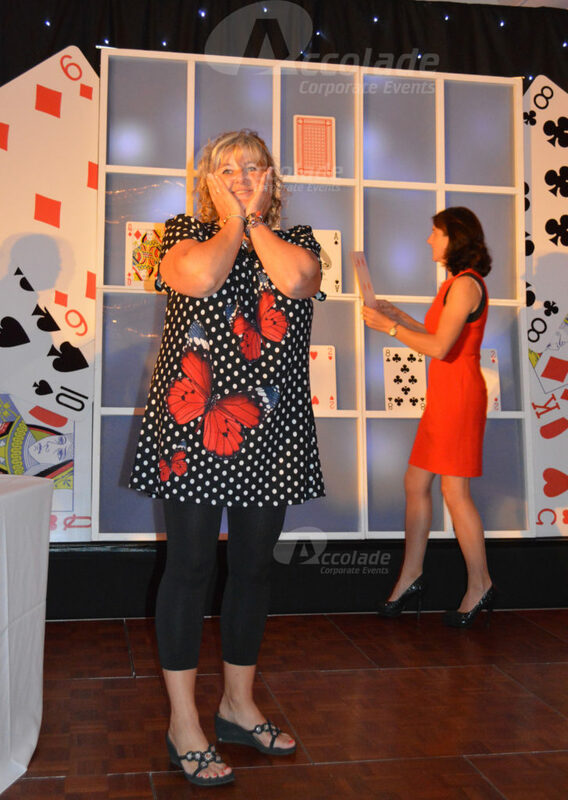 In Play Your Cards Gameshow our giant illuminated card wall provides a fantastic back drop for your event, as soon as your guests come into the room you can hear them whispering and trying to guess what they are going to be doing. Playing as teams we’ll have all your guests competing to take control of our giant illuminated card wall. Incredibly interactive and highly competitive this is a gameshow that will really entertain and engage your guests. If you’d like to find out more information on our Play Your Cards Gameshow, then call us today on 0800 083 1172 . We’ll be able to answer any questions you have and send over a no obligation quote for your next event. Want to change the tune? We think you’ll love our fantastic Name that Tune event!